You can have multi-way intercom with up to seven other SRL2 users by creating an intercom chain. Both the head and the tail of the chain can add new participants. 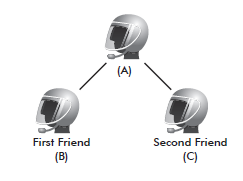 For example, if you have a three-way intercom set up, the new participant (D) can be added to either (B)-the head, or (C)-the tail. If (D) were added to (C), then (D) becomes the new tail of the chain. If (D) were added to (B), then (D) becomes the new head. In this way, an intercom chain can hold up to a total of eight people. 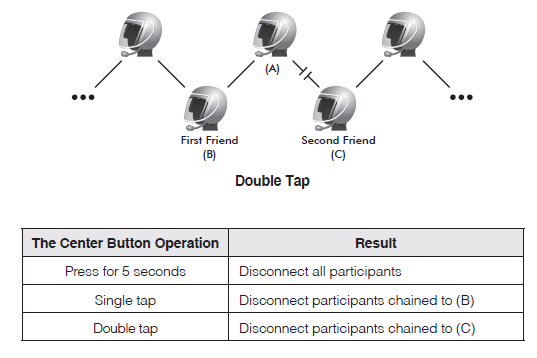 To have multi-way intercom with more than four participants, you must enable Eight-way Intercom. You can completely get out of the multi-way intercom or just disconnect a part of the chain. 1. Press the Center Button for 5 seconds until you hear double beeps to terminate multi-way intercom. It terminates the intercom connections between you (A), and all participants in the chain. 2. Single tap or double tap the Center Button to disconnect intercom connection between one of the two intercom friends. A single tap will disconnect the intercom connection between you (A) and (B). Rest of the connection of the chain will be preserved. Likewise, double tap will disconnect the intercom connection between you (A) and (C), while preserving rest of the connections.